There was that wild day when I found myself home with this new living being – my first child. …ALL the attention shifted to the baby. I’m including myself in that statement. THAT’s where I (we) messed up. 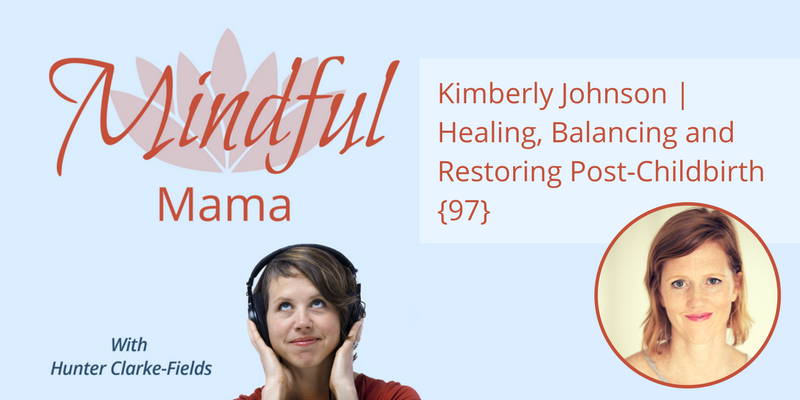 I realized it talking to this week’s Mindful Mama Podcast guest, the amazing Kimberly Johnson. I messed that time up, and my lack of healing has repercussions today. I’m willing to bet the same may be true for you, too. I talk to Kimberly Johnson about healing, balancing and restoring post-childbirth. There are big problems with the way we handle birth and the post-partum period that are leading to long-term problems for moms. We have unrealistic expectations about 4th trimester; healing is slow. We treat it like it’s any other time. We don’t understand that there are specific needs. Kimberly Johnson is a Certified Sexological Bodyworker and Somatic Experiencing Practitioner. She works in the areas of birth support, postpartum healing and sexual health. She has just released her new book, The Fourth Trimester: A Postpartum Guide to Healing Your Body, Balancing Your Emotions and Restoring Your Vitality that is published by Shambhala Press. You can learn more about her here. What do you think? Did you mess up this time too? ?